It is simple, just double-click on the content area where you are reading the wave. It will show two options - reply and edit. Select "edit" and you are done, it will open-up the editor. This is much faster than selecting “Edit this wave” from the menu at top-right. When you make a wave public, by adding public@a.gwave.com, you now get an option whether you want to give read only access to the new user or full editable access. Read-only participants can only view the wave and look at the history. But they can neither add anybody to the wave, nor can they make any modification to the wave. You can add a Google Group to a wave, set permissions and then view and edit waves with that group. This is a very useful feature for a person like me who uses wave for group collaboration half the times. In one of my astrology forum, I used Google Wiki for writing an ebook with my forum members and Google Wave is even better. Love you Google and Google Wave. Looking forward to the invitation for Google Wave on my Google Apps. 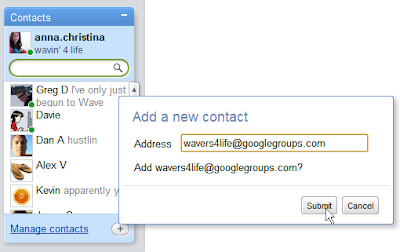 While using Google Wave for any serious work, always keep in mind that you can not remove a user from the wave. Which means, that other user, even if accidently added to the wave, has as much control as you do. You do not own the wave created by you. So, be careful for using Wave for any official/ confidential kind of work that you do not want to share with the world.